When it comes time to purchase just the right gift for Mom for Mother's Day, I often struggle coming up with quite the right thing. After a while, the items in the store all start to look a little bit the same to me, so how do I find something that is unique and special enough that it shows my mom how much I care? Therefore, when I am introduced to a website that connects me with thousands of master artists from around the world and gives me the ability to select from more than 30,000 handmade works of art, then I can relax knowing that I'll be able to find just the right piece from NOVICA. One of the leading fair trade artisan websites, NOVICA.com works with National Geographic to give talented artisans around the world a place to express their artistic talents and provide access to the world market. By offering thousands of limited edition and one-of-a-kind pieces of jewelry, clothing, unique gifts, and home decor, you'll not only find items that are each stunning in their own way, but you'll be helping others by making your purchase. NOVICA has already succeeded in helping change the lives of tens of thousands of people in developing nations, a number that I find both inspiring and extremely impressive. So while you may just think that the handbags or sculptures are lovely, NOVICA has provided a way for the artisans who created them to earn personal recognition and receive real-world prices for their work. Now that just makes all of their great pieces even a little more beautiful, doesn't it? 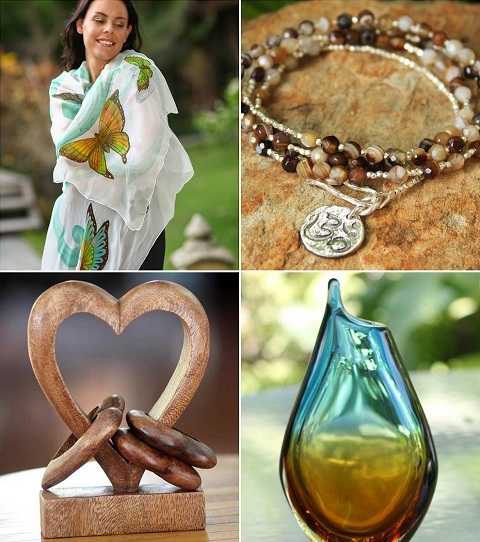 And when it comes to all of their unique gifts for Mom, NOVICA truly makes it easy to honor her with a keepsake gift that she will always treasure. Whether your shopping list says Jewelry gifts for Mom, Sculpture gifts for Mom or you simply just want to put a smile on her face, NOVICA makes it easy to narrow your search to make it quick and easy to find an item that will work just right with your mom's personality. I purchased these beautiful Blown Glass Tumblers for myself and couldn't be happier with how gorgeous they are in person! 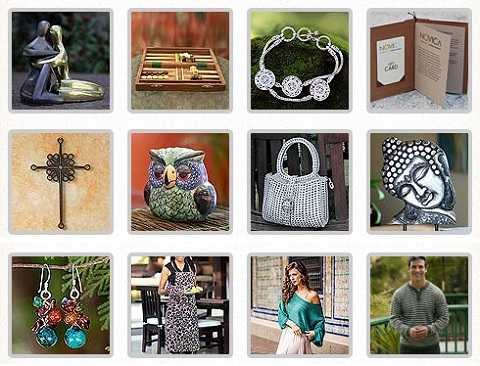 When it comes to shopping for a unique gift that is unusual, real-world as well as beautiful to behold, NOVICA has a huge selection that is sure to provide plenty of options. But, of course, the fact that by shopping there you can help make a difference in improving lives and preserving traditional crafts worldwide just means that you (or your recipient) can be even a little more satisfied with your purchase. One lucky person will win a $50 gift certificate* to NOVICA! *Gift certificate is in the form of an online gift code and will be valid until 6/24/13. I'd like to receive the Confetti Glasses made by Javier and Efren of Mexico. I'd love to give one of their chess sets! I love the wood sculpture "Essential Elephant"
I really love the Sterling silver heart ring, 'We Two'. I'd love the Snow Queen pearl dangle earrings. I'd love the Jade jewelry set, 'Evergreen Clusters'. id love the Murano Glass vase! "An angelic trio dressed in Andean tradition sings songs of faith and hope. Playing a flute, guitar and zampoña (a traditional panpipe from the Peruvian highlands), their delightful images attest to the Ayacucho ceramic legacy. Infusing belief with traditional fervor, Feriberto Aylas handcrafts these angel figurines." I would like to have their Blown glass goblets in 'Amethyst Tulip' (set of 4). I really like the wooden sugar bowl. They have so many items....it's hard to choose! I like the wood sculpture "Upside Down Love." I like the Wood wine bottle holder, 'Gift from the Sea'. I like the Emerald Spiral pitcher. The Ceramic vase, 'Forest Leaves' is beautiful! I like the Leather bracelet, 'Floral Red'. Thanks for the chance to win! I like the Shoulder bag, 'Dark Dalmatian'. I love their recycled bags. Would love to receive the Smoky quartz solitaire ring, 'Miraflores Mist'as a gift. I would like Wool tapestry, 'Forest of the Birds'. I would love to give the Alpaca blend shawl, 'Crimson Harvest' to my Mom as Mother's Day gift. It's gorgeous. I'd love their Mohena wood and leather chess set, 'Colonial Octagon! Thanks so much for the fantastic giveaway! I like the tiger trance tiger's eye necklace. I would love to get the "Ceramic dinner plates, 'Blue Chrysanthemum' (set of 4)". I would like to get the auto parts chess set for my brother. I think this set is awesome! And my brother loves chess. I like the Sterling silver ring, 'April Daisy'. Love the vase called Amber Fan. I would love to get the Hammock swing, 'Caribbean Nights'! Any of the glassware! I love the glasses, pitchers and vases! I like the backpack travelers bag and accesories. Love the Tea For Two "Frangipani" set. Love the pretty blue color! I like the Blue Jasmine scarf. I love the Blown Glass Tumbler. I did not know this site and I must admit that there are fantastic items! I would love to have the Murano handblown vase, 'Amber Volcano' (small) by Murano Artisans of Brazil. I like the Margarita glasses, 'Happy Hour' (set of 4) and the shot glasses for tequila as well. I love the Blue Fantasy placemats and napkins! I'd like to receive the Amethyst dangle earrings, 'Make a Wish' by Made Kencana. I like the Tumblers, 'Cobalt Dreams'! Absolutely love the Cotton hammock swing, 'Copacabana'! Would love to put this in my yard so I can relax outside! I would love the Cotton scarf, 'Orchid Shimmer'. 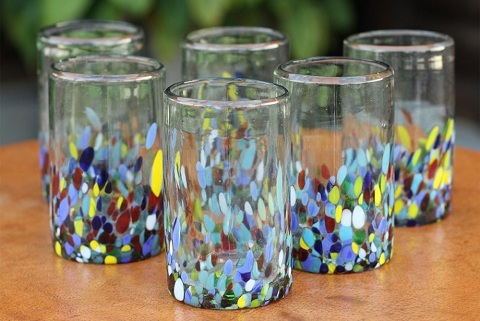 Love the multicolor specks beer glasses! I like blue locus flower necklace. I love the Lilac Jade Dangle earrings! Very beautiful and unique! Wow... I can only dream ofa rug like the "Hummingbirds" one. Wow! Completely gorgeous. The transformation wood folding table is cute! I like the Mirror, 'Land of the Lily'. i love the mango wood vases from thailand a ton! I'd like the Iron statuette, 'Rustic Elephant'. Thanks. Iwould love one of the gemstone trees! I adore the cotton scarf 'Orchid Shimmer'. I love their gecko earrings. I love the blue jasmine scarf. I like the blown glass pitcher. Love the Gold plated filigree dangle earrings, 'Circles of Lace'. I love the "Persian war" chess set. I would love the Teakwood cutting board, 'Circle of Life'. I love the Narcissus of December blue topaz earrings. I would love to have the Confetti Glasses made by Javier and Efren of Mexico. I want the mystery lady jewelry box. I would either like an alpaca poncho for myself or blown glass Mexican wine glasses for my brother. I would love to receive the Lacquered wood box, 'Owl and Its Secrets'. I would love to receive one of the hammocks. I like the Soapstone sculpture, 'Mother of Triplets'! I like the cotton and leather shoulder bag, 'Maya Rainbow'...I would love to give or get it! In recent years I've been buying my now 90 year old Mom exquisitely meaningful and graceful Sculptures from Novica for most special occasions (most recently Mother's Day!) But there were at least a dozen more / other "statuettes" (with in my price range!) that I would still love to give her while I can. One is a lovely wood sculpture by Nyoman Karsa (Bali/Java) called "A Mother's Love." on his desk in his home office! I would really love to recieve the Celadon ceramic vase, 'Thai Peony'. It's just gorgeous! Thanks so much! Definitely the Hammock, 'Glowing Sapphire' (double)-my husband and i were just looking at hammocks at Home Depot-and they were not as nice as the ones on Novica!! I would love to give the 'Inca Star' Cuzco plate to my mother for her birthday. I LOVE their jewelry. I would pick a necklace of freshwater pearls. I love the 'Lilac Sparkle' ring! Thanks for the giveaway! I love several jewelry items especially the Pearl and jade pendant necklace, 'Touch of Life'. I'd love to get the Royal Pheasant hammock as a gift. I like the Christmas Owls! I would like to give the olive feast cotton hammock as a gift to my dad and stepmother. I like the Mekong Sun earrings. I would love to get my mom the Deserted Beach Hammock Swing! I like the Murano glass vase, 'Black Tie'.